Christ notes the weights and measures he, as Judge, will compare them to: Justice, Mercy and Faithfulness. The scribes and Pharisees would weigh out the exact amount they owed to God. Christ points out how useless that exact measurement was compared to the weight of their sin. Throughout Scripture, God uses math terms to show that he is measuring and weighing our deeds, comparing them to a standard. Knowing that “average” is not good enough is crucial for salvation. You have to match his requirements. Exactly. The only way to meet his requirements is by going DOWN, and Christ will lift you up. Listening to Christ we can find how to clean the inside of the cup. By kissing the Son, by being found in him, we can gain a different category. 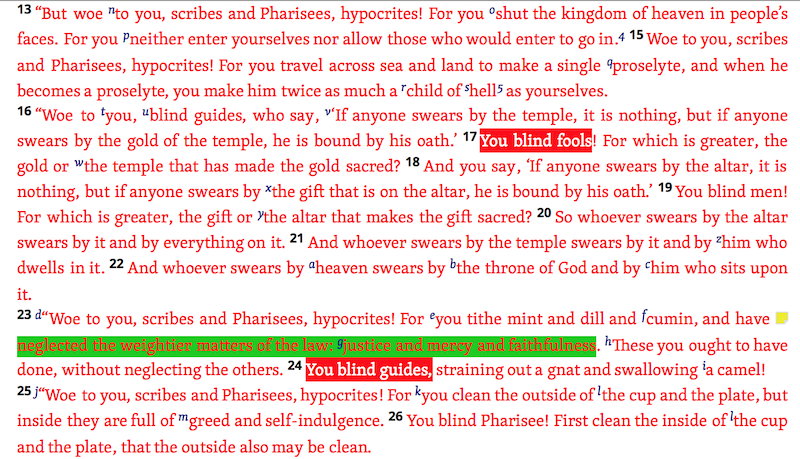 Appearances do not cut it (v.28). God is using his own standards, which will result in failure and condemnation. In verse 32, the word “measure” refers to a scale God is using to weigh out the punishment the “fathers” had earned, and if the scribes and Pharisees did not repent that measure would be theirs as well. Because they were sentenced to hell, “therefore” (v.34) God sent them prophets, to warn them. Below, in verse 2 we see hints of that greater Temple Christ was going to build, the City not built with human hands. Ezekiel’s Temple, which was made up of the faithful who had been measured and approved. You are being measured and tested. Do you know how to measure up? Do you know what God is looking for? God’s Covenant is a Separation Filter. The requirements of the Covenant will push people into a camp, reflecting their essential character. Are you drawn to the Covenant-keeping God, or are you repulsed by him and his people? In verses 34-35, Christ points out that truth-speaking prophets and wise men have been sent, and will be sent. Those who carry a Covenant message present onlookers with a choice. Will you bend to the words they carry? Will you show them respect and love? Or will you hurt them? How we treat the Church of Christ reflects who we are. In this case, those who come are broken men who have been required to carry a message. Old Testament prophets always claimed a feeling of unsuitability to the task, yet they obeyed. How do you treat those who carry the Covenant message? 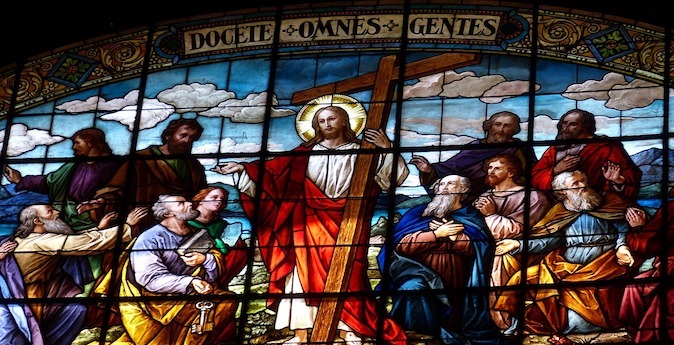 Christ has chosen his Church, faulty as it is, to carry something precious. “But we have this treasure in jars of clay, to show that the surpassing power belongs to God and not to us.” (2 Cor 4:7-9). Ambassadors of the King, while not the king, are to be treated as the representative of that King. Look below at verse 37. We hear echoes of the story two chapters earlier (Matt 21:33-41), where the prophets and the son himself are killed by those tending the vineyard.